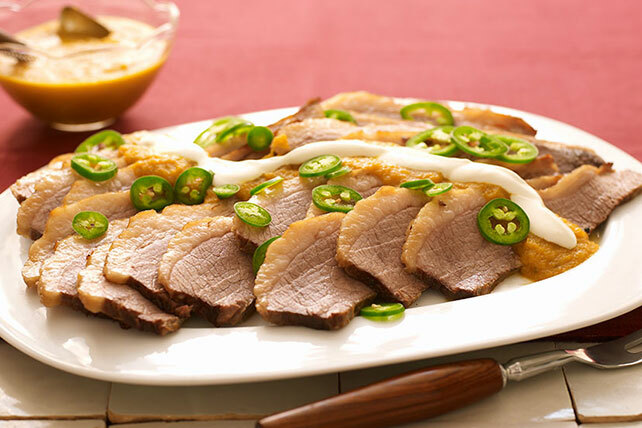 Kick up your beef brisket with a spicy jalapeño sauce. Our Beef Brisket with Spicy Jalapeno Sauce is tender, juicy and spicy. What more could you want? Heat oven to 350°F. Heat dressing in large skillet on medium-high heat. Add meat; cook 5 min. or until evenly browned, turning occasionally. Transfer to roasting pan or 13x9-inch baking dish. Surround with vegetables. Add water; cover tightly with foil. Bake 2-1/2 to 3 hours or until meat is done (160ºF). Let stand, covered, 10 min. Meanwhile, transfer vegetables to blender; blend until smooth. Add 1 cup meat drippings from bottom of pan; blend well. Cut meat across the grain into thin slices. Serve topped with vegetable sauce and sour cream. Serve with smart side dishes, such as hot steamed broccoli and roasted potatoes. Bake and slice meat as directed. Return meat to drippings in roasting pan. Refrigerate up to 2 days. When ready to serve, reheat, covered, in 350°F-oven 1 hour or until meat is heated through. Continue as directed. Top with additional jalapeno peppers, sliced, just before serving.